[Calamity] Red Noose - Engi no Jutsu - The Best Naruto RP on the Net! Well, then you gotta be mine. Shipori packed lightly. The vision had been wholly unhelpful, nearly as useless as the summons he received direct from the Wardens of Calamity Mountain. But, he had done his homework, as he always did, and he had an idea of what to expect. A few changes of clothes, some basic supplies, that was all he needed to survive basically anywhere, even the foreboding Calamity Mountain. He supposed he should have been more impressed with the strange timing of it all, the powerful implications of true mysticism, but Shipori found himself nonplussed. After the Chuku and the Red Mother, Shipori considered himself an expert on practical weirdness. Some time had passed since then, though. Enough for him to recover from an unpleasant shoulder gash and to chase Moko out of his hair by providing him a translation of the second scroll. The matching pair proved to be quite the treasure – one Shipori had no reason to hoard for himself. In the weeks since cracking the code and passing the results off to Moko, the fraying of his own coils had reached a stopping point. A once perfect ring, the infinite loop of his beautiful chakra, had grown thorny and twisted, but not broken. He recognized the condition from old Sound texts. Shipori found himself able to form ninjutsu, and struggled to mold the simplest bit of Chuku jutsu. His shop in the City of Kings had suffered a single, ill-fated break in while he was away; a young nukenin who thought he might earn some bread stealing the Aizawa's shelves. Shipori considered letting him go with most of his limbs still attached to be a mercy. Now, as he packed up his small bag, he had set a collection of clones to truly disassembling his office. He had no idea how soon he would be back to Iron, and he had a gnawing worm of paranoia at the back of his brain stem. His precious things found their way into the pages of his book and the rest he had smuggled to other hiding places. Still, he paid one of the locals to come by the empty storefront and check up on it while he was away. Shipori stepped out of the City of Kings and summoned up a great inken bat, and took wing to Valley Country. Shipori stopped to rest in Valley Country. The village was rustic, but used to travelers. Merchants made their way through the town between more important points of commerce, and rarely a miko moved through the village on pilgrimage. Often, Shipori heard, this was to Calamity Mountain itself, as the most well known holy site in the country, but miko had their own secret ways and secret places, so few could say for sure where this one or that one ended up. Shipori took the night too rest at an inn and speak with the locals. A perennial city boy, he found deer hunting and dirt farming quaint. In the morning, his carriage arrived. He stepped out of the inn looking as refreshed as he could manage. Shipori looked his age – he had for some time, since they had freed him from the rubble and he corrected his calendar – but for now, he thought to lie about his position. Aizawa Shipori, the shinobi scientist, the defector of Sound, needed to be shut away. Here stood a different Shipori who played the part of the scholar, but not the soldier. He suspected the miko to see through his facade, but he planned to wear it until it crumbled to dust and slipped through his fingers. The carriage was a charter used to minor dignitaries, traveling professors, and others with a bit of coin to ride in comfort. The closed chamber, constructed of a rich, dark wood, had two benches of soft, crimson cushions. A lattice sun screen sat over the small windows to offer some privacy and protection. Shipori hobbled up the two steps into the carriage proper, took his seat, and lay his book and can next to him. A few moments passed before the driver took the reins and they started on their way. When the carriage came to a slow stop, Shipori had nodded off with his journal open across his lap. The lilting halt jostled him awake. Through the screened window, Shipori saw the rusted sun beginning to set, and no mountain in sight. Shipori had calculated the time carefully to allow them to arrive at the foot of mountain before dark, following rumors of strange creatures that might beset a traveler in the night. If they were this far out, the driver was behind schedule. Shipori heard the man moving outside and then, with little fanfare, the door to the carriage opened, and a second passenger climbed aboard. 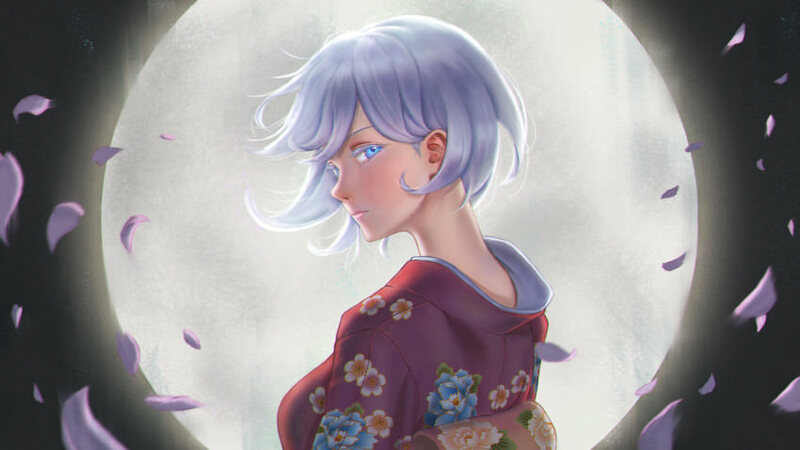 She wore a fine kimono decorated with flowers and dyed a deep red. Pale, blueish gray locks swept about her ears in a simple bob. Her features were fine and delicate, rosy like spring, but her eyes were frigid and bright as winter morning. The woman looked just young enough to be Shipori's daughter, and if Shipori didn't know better, he might have made that leap in logic. She carried no luggage of her own as she sat on the bench opposite Shipori. The driver shut the door behind her and, before Shipori said a word, they started to move again. The woman reached into her robe and revealed a plain porcelain bottle, which she uncorked. In the close quarters, Shipori smelled the sharp rice wine before she even brought it to her lips. She didn't offer him a drink, but kept her hands folded over the sake as she held it in her lap. She smiled broader than the moon. The carriage rumbled on. Shipori knew that he should be nervous, afraid even, but a stifling sense of calm kept him weighted into his seat. As the carriage wheels turned, the strange woman brought her bottle to her lips again and took another drink. The Red Mother, Shipori made the connection implicitly. A dying spirit at the bottom of a dilapidated shrine, the Mother had helped spur him on a quest for the sort of ancient, forbidden knowledge that excited him – and that had, at one point, led an ally towards his own demise. Things had changed, but the memory of the Red Mother's half-rotted skeleton clung to his eyes. Shipori watched her shiver, not in fear, but with excitement, a fantasy of retribution. “Of course not, little oni. We've already crossed the border, and soon we'll be home.” A thin hand, her nails pointed like claws, pointed towards the window. Outside, the sky lay as a blanket of tar dotted with distant stars. A full moon hung low in the sky, so close that Shipori could trace craters through the lattice. The dirty mountain road now grew claustrophobic with a twisted forest pressing close to the carriage. Dozens of yellow eyes shown out of the shadows to watch the carriage as it rolled by. Shipori looked back from the window to the woman he rode with. The air prickled his skin. A charge pulled at his chakra, tried to coax it free, as if it might unravel him. Unlike the Chuku magic, however, Shipori found he could ignore this particular shredder. Ibako finished her drink with a haughty smile, and the carriage came to a rest. Heavy steps from the driver and the door opened, so Ibako made her way outside. Shipori gathered his cane and tome, then made to follow her. First, the man who held the door was not the driver Shipori hired. Shipori knew this because his driver didn't have red skin, tusks that pushed past his lip, or short, curved horns jutting from his forehead. Their eyes met and Shipori caught the driver's lip curl in a sneer, but they said nothing to each other. Ibako had already started to walk away from him – she slowed her pace to allow Shipori to comfortably catch up with his limp. A series of broken stone steps led up a gentle hill. Moss grew along the cracks in the walkway. Along either side of the pathway were a number of ornamental lanterns, toppled statues, and shrine markers. Everything here had seen better days. At the top of the hill was a flat courtyard and the shrine itself – Shipori hesitated to call it a shrine. The massive stone structure certainly had a convincing shrine as a facade, but it was set against a tower fortress that loomed over the much smaller entry building. This was a castle, or perhaps a palace, if it belonged to Ibako. From carved slit windows, more golden eyes glared down at the pair as they passed through the yard. To either side of the castle were similarly gargantuan statues: one an old priest, the other a fearsome ogre. The latter's head lay in three distinct pieces on the ground near its feet, as though it had toppled. Shipori made his way across the shrine's courtyard to a dust covered donation box, partially rotted through. He withdrew a coin from his wallet, prayed over it in silence, and dropped the coin in. The metal bounced off bare wood inside. Ibako watched him with her head tipped and a sharpness in her eyes. The blue in them had faded and a yellow luster grew beneath. Her face, still pale, had a rosy blush that spread under her cheeks and down her neck. They walked from the box past a cracked bell and towards the entrance into the shrine proper. The doors slid open at Ibako's unspoken command. She stood at the precipice and turned to offer Shipori a clawed hand. He laid his palm in hers. Inside the shrine, Shipori found the front rooms finely decorated. A low table sat in the center room, already laid out with a black tea pot and a set of cups. The tatami mats and paper screens had been changed recently – they didn't match the worn age of the wood in the wall frames. Paired scrolls hung from the far wall, one depicting a red oni brandishing a club and the other a blue oni drawing a sword. Between them lay a heavy iron door which Shipori guessed led into the castle proper. Archways to the east and west lay blocked by kneeling servants. They were not ogres, as Shipori expected, but instead looked to be humans clad in simple white robes. Ceremonial sealing tags hung down from their foreheads and covered their faces, but he saw that their eyes were black and empty. As Ibako sat at one side of the table, one of these servants slid into place to pour tea for her, and then for Shipori. When Shipori knelt, his cane floated into a servant's hand, and they waited there to be sure he managed to sit with his bad leg. And they disappeared into the scenery. Shipori stared down at his cup and the steaming green tea. Ibako brought her cup to her lips. Her pale skin had completely filled in with a vibrant scarlet now, and a pair of curved horns rose up from her forehead. He wrapped his hands around the cup to feel its warmth bleed into his palms. Shipori swallowed the tea down and it tasted like sand in his throat. Silence hung between them before Shipori set his cup down, placed his hand over the top of it. Ibako swept a strand of hair away from a horn. He knocked Ibako's hand away, she leaned back into her seat. From deep within the castle, a low groan echoed through stone halls. The door behind Ibako rattled – Shipori heard the scraping of claws and muffled howls. A glance to the door and back to the ogre woman; the din settled and the shrine went quiet again. Shipori braced a hand to the table. His heart thrummed loud in his chest and blood pounded in his skull. His vision swam, blurred around the edges when he tried to focus on Ibako. She brought her hands to his face and cupped his cheeks. They tipped his jaw and, for a moment, Shipori thought they might be about to kiss. The shrine spun around him and he tried to repeat those foreign words – his mouth hardly knew the shapes. The carriage rolled over a rock and jostled Shipori out of his seat. He sat up, startled, and looked at the empty bench across from him. Sunlight still shown through the window. His book had fallen to the floor, and he reached to pick it up without a thought. Shipori fanned to the last filled page, but found just descriptions of Valley Country birds and plants. Nothing about the shrine or the woman. The trip continued without incident. They arrived at the shrine of the high oracles, and Shipori saw that his driver was just a man after all. The shrine was expecting him and he made his way to a holding pen with the rest of the invited guests. Shipori took some notes on the shrine itself and the others who had arrived. Shinobi, mostly, and he found himself unimpressed with most of them. When he grew bored with them, he tried to remember what he had been dreaming about, but it slipped through his mind like a sieve. A woman, a demon, and a warning.